Free Download Movienizer 9.2 - Put your movies in order with Movienizer. Movienizer is a must-have movie catalog tool for all movie fans and those who like to keep all things cataloged, organized and tracked. Start creating your interactive film catalog right now. Start your personal movie database and add your movies by title, from files, or with a barcode scanner. 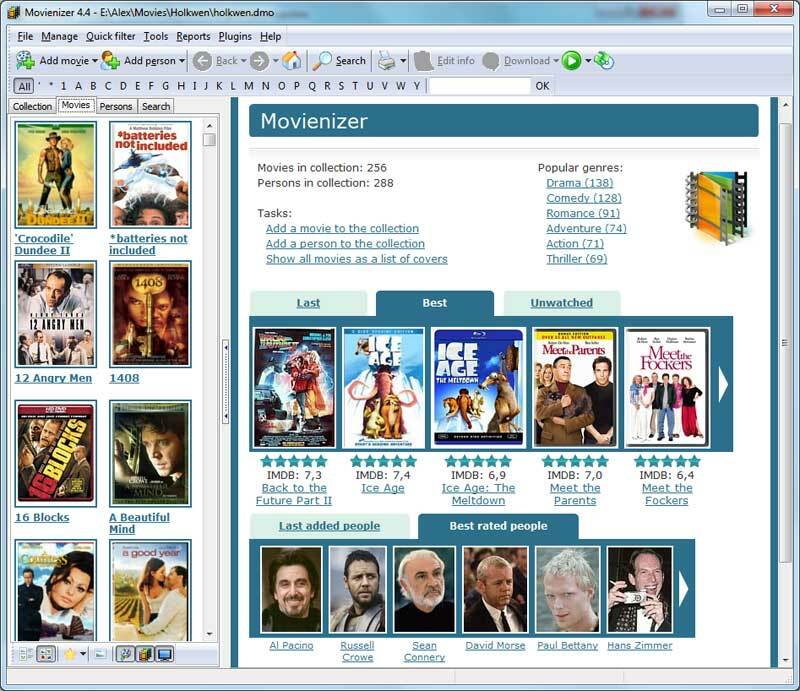 Movienizer will search the online database you prefer and download information about your movies. In the next step you can edit or specify additional information by adding a disc number and location, your personal rating, movie snapshots and comments, and much more, finally saving it to you movie collection. Movienizer is not just a movie organizer. You can learn anything about a particular movie or an actor, actress, director, screenplay writer. All the information is interlinked in the database, so you can browse through Movienizer the same way you do on the net and find out amazing facts about your favorite movies and actors. When all your movies are cataloged you may want to sort your film collection with different criteria to explore it more easily. Movienizer offers several ways to do it. You can easily sort your movie database by genres, title, directors, etc. by clicking the corresponding items. Another way is to use the "Collection" tab, or the powerful search engine to sort movies by multiple criteria. Additionally the quick filter and quick search features can be used. Find all films you watched with Angelina Jolie in a single click with Movienizer! Movienizer allows you to customize your collection by writing comments, adding personal ratings, snapshots, editing lists of genres. Movienizer supports even custom fields for the most demanding users. Information from your movie database can be exported for such hardware players as HDI Dune, WD TV, Google TV. Plugins extend capabilities of the program even further: you can easily rename your video files, export covers and movie information to Windows Media Center etc. Thousands of users prefer Movienizer to other movie catalog programs. Want to learn why? Download and test the free demo version now! Thank you for a truly remarkable program, The Movienizer. I now have all 945 of my movies cataloged and in a classy program to show my friends. Thanks for Movienizer, I use it every day ! I like movienizer very much. So thank you for that. Movienizer is a very good software program. Thanks for a most excellent product in Movienizer, I am close to the 1,000 movie mark and it works brilliant for me, I am able to load into my PDA to carry it when shopping to add to the collection. Thank you and the team. Excellent program and FANTASTIC service! Audio CD Burner Studio 6.0 - Fast and easy-to-use software to burn MP3 to Audio CD, WMA to CD, WAV to CDA. AudioConverter Studio X - User-friendly CD ripper and audio converter for MP3, WAV, FLAC, APE, and more. Booknizer 8.0 - Booknizer is a powerful book organizer for paper, electronic and audio books. Free M4a to MP3 Converter 9.2 - Free M4A to MP3, AAC to MP3 converter with a functional minimum of features! Media Catalog Studio Lite 5.9 - Smart collection manager for music and video in more than a dozen file formats. Medianizer 9.2 - Medianizer is the newest generation of movie, music and book organizers. MIDI Converter Studio 9.1 - Convert from MIDI to MP3, WAV, OGG, WMA with MIDI Converter Studio. Free trial! MIDI to MP3 Converter for Mac 6.2 - Convert MIDI to MP3/WAV with Mac. Use SoundFonts for high speed & quality. Movienizer 9.2 - A powerful tool to sort, research, track and catalog your movies easily. MP3 Recorder Studio 9.0 - Easy-to-use software for recording every sound from any source on your PC. mp3Tag Pro 9.5 - Sort and organize your music collection using fantastic tools of MP3 tag editor. Music Duplicate Remover 9.2 - Locate duplicates by sound, ID3 tags or both and remove them in three clicks! Musicnizer 8.0 - Catalogue and manage your music albums in any format and learn more about them. Video Converter Studio X - Convert your videos and rip DVD / Blu-ray discs in just a few simple clicks! Visual MP3 Splitter & Joiner 10.0 - Quick WAV/MP3 Cutter & WAV/ MP3 Joiner. Splits MP3/WAV with no quality loss. Love watching movies? Collected so many that you're getting lost among the many discs? Get your movies organized with Movienizer! Organize, track and research your movie collection easily with the powerful movie cataloger.